I’ve always enjoyed my hotel stays in Microtel Inn & Suites. But I must admit, this specific property in Baguio exuded a more charming setting compared to the other properties that I've been to. Despite the cold breeze up north, I loved how warm and kind the staff were towards their guests. I also couldn't rave enough on how superb our room was, and how near the hotel was to a lot of restaurants and sites. There’s just so much to love about this hotel, that I can't help but give it 5 stars! Microtel Inn & Suites – Baguio has eye-catchy, pastel blue walls. Even with the vibrant facade, you still wouldn’t miss it because of its well-positioned location. Not only is it right beside the Victory Liner Passenger Center, the hotel is also a short walk to SM Baguio (10-minute walk) and Session Road (15 minute walk). My Kuya and I took the Victory Liner bus going up north, and we alighted right beside the hotel. There was even a walkway that was connected to Microtel Baguio. Talk about accessibility! We arrived too early for check-in, so we decided to have breakfast first. So right after logging my details, we left our bags at the reception and started walking towards SM Baguio. While the mall was just a 10-minute walk from the hotel, we opted to have our first meal in the City of Pines by Hill Station at Casa Vallejo. And after our hearty meal, we made our way to the Baguio Cathedral to thank the Lord for blessing us a safe trip. Now, it wasn’t long until Microtel sent me a text message saying that a room was already available for us. Talk about an early check-in still! One more thing that I liked about Microtel’s location is that it was near a 7-Eleven store. I was so tired on my second night in Baguio (given all the walking that I did the entire day), that I opted to just buy dinner from the convenience store. Good thing they still had hotdog sandwiches available and CTBL tea bags. Now, if you don’t feel like walking from one site to another, don’t fret, as there are plenty of cabs in the area. Taxis are quite affordable. Even the drivers will make sure to give you your change back, which is very noble and honest. 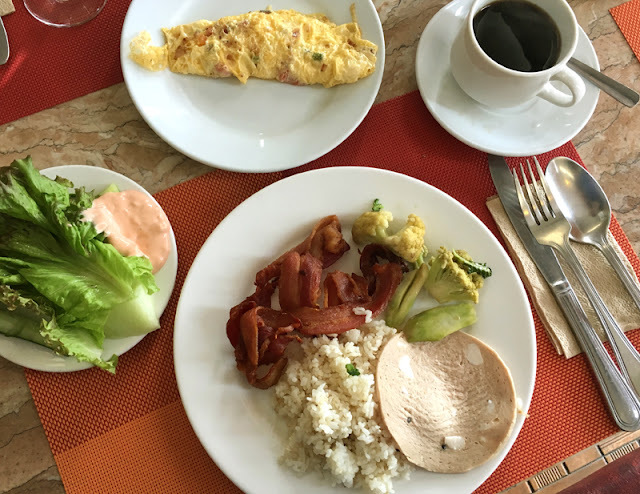 TIP: Other than the usual fast food options available at SM Baguio and Session Road, Microtel is also near a variety of eateries such as Pamana, Hawaiian BBQ, Tsokolateria and Barrio Fiesta (all located by the Igorot Stairs). Café by the Ruins Dua is also a short walk from Petron (along Upper Session Road). Moreover, nearby spots that are worth visiting (and walking to) are UP Baguio, Museo Kordilerya and Baguio Museum. Microtel Baguio has a praiseworthy staff. They were always accommodating, and they made sure that I got my request of toiletries and an envelope sent to my room right away. I also commend the two Security Guards during our stay last May, who were always on their feet, and doing their rounds 24/7. One of the guards that was on-duty was nice enough to take my photos by the hotel entrance. Aside from the staff, the lobby was an area in the hotel that I also enjoyed staying in, as it offered a space where guests could hold casual meetings (you can gather around with family or friends while you chat or watch TV). Tables, chairs, and couches were available in the lobby, along with an unlimited supply of complimentary coffee and water. Water dispensers were also present on every floor, so I did not run out of my hot and cold supply. The hotel in its entirety has warm tones (they chose a good selection of paint and fixtures), a great compliment for a hotel that is built in a cold setting. I certainly loved the blue exterior of the hotel, as it was, for me, the most beautifully designed property out of all the Microtel Hotels that I’ve stayed in. Moreover, the American-inspired architecture definitely added more beauty and elegance to the building. Children that are 12 years old and below (maximum of 2), are also allowed to share the room with adults for free, given that they will be using the existing bed/s. But what else is available? There's Te Quiero Tapas Bar & Restaurant, a Meeting Room (for up to 6 persons), Non-smoking rooms, Accessible facilities, Wireless Internet access, Safety deposit box at the front desk, Massage (prior reservations required), Photocopy, fax, and mailing services, and Ample parking space. What I always look forward to when staying in a Microtel hotel is the room, as it has everything that I love and more! I love that I got to stay in a 2 Queen Beds Room again, so Kuya and I got to relax on a Chiropractor-approved mattress each. Yes, the bed is always the highlight of my stay in Microtel. Sleeping on it, with the thick duvet and plush pillows always guaranteed me a good night’s sleep. There was plenty to like about our spacious and clean room. The A/C worked perfectly well; and the room’s configuration, interior design and furnishings looked consistent with all the Microtel Hotels that I’ve stayed in before. Also, the TV and cable reception were both in good working condition. We were able to catch up on old movies and some documentaries from our favorites cable channels without interruption. Even the Mountain View of the room was nice and refreshing to look at. There might have been a lot of rooftops on sight, but these never really obstructed my line of sight. Aside from the 2 Queen Beds Room, other rooms were also available like the 1 Queen Bed, which also has a chiropractor-approved mattress. A 1 Queen Bed Suite is also offered, which has all the prior mentioned features and amenities plus a Coffee making facility, Refrigerator, Microwave oven, Kitchen counter with sink, Sofa sleeper and Bath tub. I also look forward to hot baths in Microtel's clean bathrooms. Despite the water situation with Baguio's uphill setting, we never ran out of supply at the hotel. I actually showered A LOT during my stay because it would be hot in Baguio during the day (we'd usually return to the hotel sweaty and all after sightseeing), but would be cold and rainy in the afternoon. While the restaurant’s space looked small, I was surprised that it could still accommodate a lot of guests during breakfast. I've managed to dine in both areas of the restaurant. But I enjoyed eating by the open-air setting more, as the windows were always kept open. Breakfast on our first day was just ok, as there were limited food options. But the food the next day was way better, as Te Quiero finally served bacon for breakfast (I LOVE BACON!!!!). I also loved that the eggs that I requested were always done to perfection, particularly their omelets. While there was an ongoing construction on the hotel, the work itself didn’t disturb us during our stay. We didn’t hear any noise whatsoever (probably since we were given a room on a higher floor). Other than that, our stay was perfect! Baguio City is accessible via Marcos Highway or Kennon Road, and is 4-5 hours away by car or bus from Manila. Upon reaching the city from Marcos Highway, turn left at the rotunda (below the flyover) into Gov. Pack Road then turn right at Governor Center Road. After Baguio Convention Center turn right at T.M. Kalaw. Cross Upper Session Road and enter R. Villalon Street to the left of Victory Liner Passenger Center. The hotel is beside the Passenger Center. When you reach the city from Kennon Road, turn right at the rotunda into Gov. Pack Road and follow the same directions as above. Microtel Baguio is conveniently located to the Victory Liner Passenger Center via a walkway. From here, you may book your trips and take a bus to Metro Manila and several provincial destinations. *Above rates are inclusive of 12% Government tax, 5% service charge and complimentary breakfast; and also applicable for 1 or 2 persons in the room. 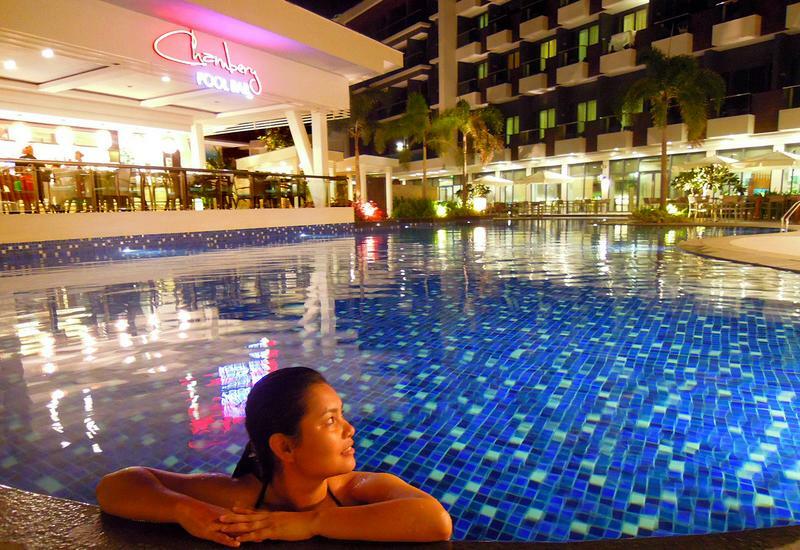 Extra person charge in the Double or Suite is P750. Note: This is a sponsored stay with Microtel Inn & Suites - Baguio (Budget Biyahera) I do not represent the thoughts, intentions, plans or strategies of the establishment or its owners. All views and opinions shared on this website are solely my own.